Ava is a clone from the future…probably. Despite having a real hook and a significant plotline for a major character of this season, “I, Ava” doesn’t really reveal much. What we know is that Ava clones act as a sort of servant-automoton in the future and that Ava herself is either one of them or the template for them. Despite this being a seriously strange thing for her to find out though, it’s just sort of glossed over, so I hope they expand upon this in a later episode. Regardless, it appears that Rip is responsible for this development as well, and I’m sure he’ll be called to testify sometime soon. Meanwhile, the timeline in 2018 is solidifying and Mari (the future Vixen) is fighting crime and helping people but without the benefit of her totem due to it never being passed down to her after Nora Darhk took it over. In an effort to get the totem back, Wally and Nate decide to stage an ambush, with Kuasa’s help. The twist here is that Damien has been replaced, as the big bad on campus, by his daughter. Kuasa turns out to be playing the villain a little too well though and betrays Nate to the Darhks for real. Luckily it leads to one of the funniest moments of the episode (which ends up being an impotence gag similar to the one between Spike and Willow in the Buffy the Vampire Slayer episode, “The Initiative.”) It’s kind of interesting to see it happen between two guys though because it’s a lot more about empathizing, in Legends, than it was in Buffy. I digress though. Due to the physical and emotional transformation of Nora, Darhk’s heart just isn’t into the whole plan anymore and it leaves him more conflicted and less committed. 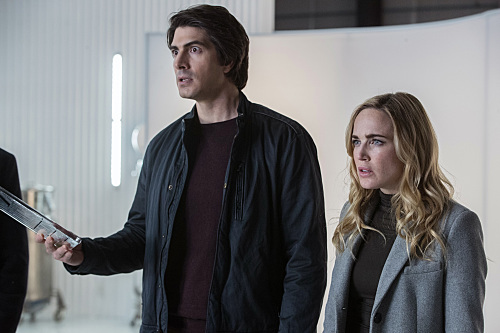 As usual, the most interesting elements of the episode’s plot in Legends of Tomorrow get delegated to the background. Kuasa has a significant arc in this episode as she struggles to maintain the future of her family, despite being vilified by the person she’s doing it for. Ava has a lot to contend with, by finding out her memories and manufactured and her entire existence came from the unexplained whim of Rip Hunter. Finally, Nora not only accepts Mallus, she actually revels in the power he gives her which makes her more innocent episodes much darker in context. The most interesting parts of “I, Ava” have yet to happen, so I’ll reserve judgment but on its own, it’s a pretty good Legends-worthy episode. Gambi is finally found out for being the ringer he is and is tortured as a result, so the ASA and Gregg Henry aka The Man (not really) can identify learn Black Lightning’s identity. There’s some serious lampshading here because there’s really nothing holding the characters back from the incredibly obvious realization until the plot deems it necessary, which actually makes the big twist at the end of the episode a little more of a joke than it probably should have been. Now for the positive aspects of the episode. I’m exceedingly invested in Anissa as a character with each episode because her arc has been short, but surprisingly natural given her character’s extraordinary background. When she succeeds, I’m interested because I’ve seen her grow and make mistakes and learn from them and benefit from that experience. When she fails, it’s heartbreaking because she’s still woefully inexperienced despite all her intelligence, training, and dedication. But this episode shows how she and Jefferson actually fight together, and it is dazzling, strategic, and effective. Because we’ve seen them train and learn how to work together in previous episodes, their cooperation is all the more rewarding because we link it to their hard work and practice. Another positive aspect of the episode comes from Jennifer’s continued efforts to deny her abilities and how the differences between Anissa and her’s philosophies actually leads to a rift between them when they both have the power to affect change. It’s especially ironic given the immense power that Jennifer is expected to be able to wield, and yet she wants nothing to do with it. It’s easy to see both sides of this argument, for both responsibility and free-will, but highlighting the values of each of these characters alongside each other strengthens both of them, and if the story continues to be about them more and more than the future of the series will surely benefit from this work. Lala is an effective villain. Still. It’s a pretty basic plus, but William Catlett has used Lala’s recent character turns as a way to project a more confident and cold menace. Lala’s cavalier approach to death factored in with Lala’s voodoo inspired powers, makes him a much more threatening figure when despite his transcending mortality, he still has a single-minded dedication to street-crime, and his terrifying philosophy has only made him more ruthless. He’s a creepy villain, sure, but he’s still selfish and petty; and his powers only magnify what was already there. Though the series could stand to put him up against the hero. It might even make me more invested in Jefferson’s stor. I think what was funny about this episode was how desperate everyone was to give Thea a way out off this sinking ship. Even the way that the story comes in to play and stops Thea from leaving comes out of nowhere. The whole episode tries to make it seem like her reasoning to stay and see the mission through makes sense, with all kinds of speeches about responsibility, duty, and honor but with everyone pushing her out and encouraging her to remove herself from the life it all just comes off as stubbornness. Now don’t get me wrong, there is a wistfulness to some of the conversations the characters have. If this is indeed to the exit of Thea’s character, then there are moments of genuine sadness and honesty between the characters but these moments are only peppered throughout a slew of forced drama and exposition. However, the way Thea takes charge, especially before the gas-main mission, is refreshing and feeds into that great ending, but for the audience, it’s too little too late; which is a shame because it does prove to be one of the best parts of the episode. Final Word: I’ll admit I was hoping for more from “I, Ava” since I like the character, but Nate’s chemistry with Darhk and Nora’s solid and surprisingly depressing turn as the season’s big bad does elevate what was probably going to be a disappointing and ineffective episode. I should have been more affected by “Sins of the Father: The Book of Redemption,” but despite having moments where the characters were actually doing things that not only made sense but also mattered, I feel like nothing was really accomplished storywise. There are significant steps to solidifying the characters, but the story doesn’t go actually go anywhere. As for “Arrow,” I can’t help but feel like the entire beginning of the episode let down what could have been a very significant and much-needed arc that divorced itself entirely from the confusing seasonlong plotline. Despite that, I was happy to see Colton Haynes as Roy proper, I was sad to see Willa Holland go, and I was thrilled to see that the story isn’t over as they set off on a mission that I could feel invested in, even if I won’t get to see how it plays out. For that reason, and two relatively uneventful episodes of two normally great series, I’d say Arrow was the best of the week; which is not much of a victory when you consider that the episode proper wasn’t that good, but it’s nice to know there are still things that Arrow can do besides killing off Laurels to affect the audience.